Have you ever been to a Zumba class? For those who don’t know, Zumba is a popular exercise program that has been around since the mid-1990s. It was started by Alberto Perez, a Columbian dancer and choreographer, and has since spread to more than 180 countries around the world. Each of the classes has its participants burn off calories through choreography drawing on salsa, merengue, mambo, flamenco and all kinds of other dance styles. For the most part, the choreography in those classes never goes anywhere besides the classroom. Still, one Zumba performance video has taken the world by storm. While all the classes are different, this one was inspired by the movie Sister Act. 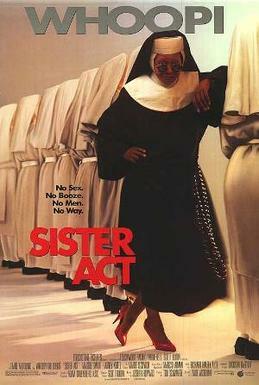 For those who haven’t seen it, Sister Act is a movie from 1992 and one of the most financially successful films of all time. The story has Whoopie Goldberg starring as a lounge singer who stays with a convent in a witness protection program. 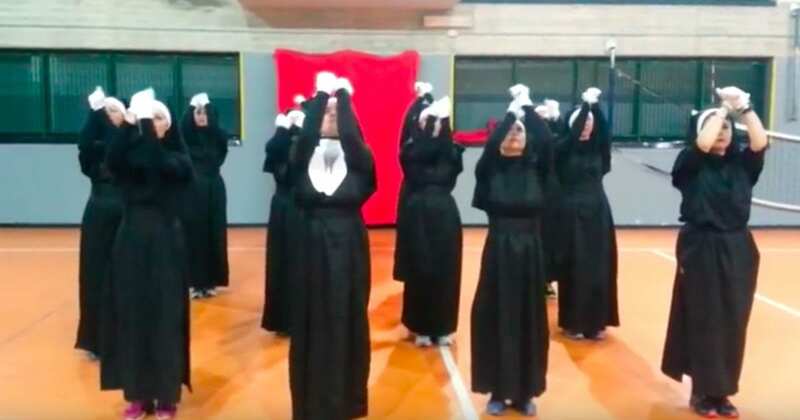 In the meantime, however, she trains the convent to become better singers and brings them new inspiration. 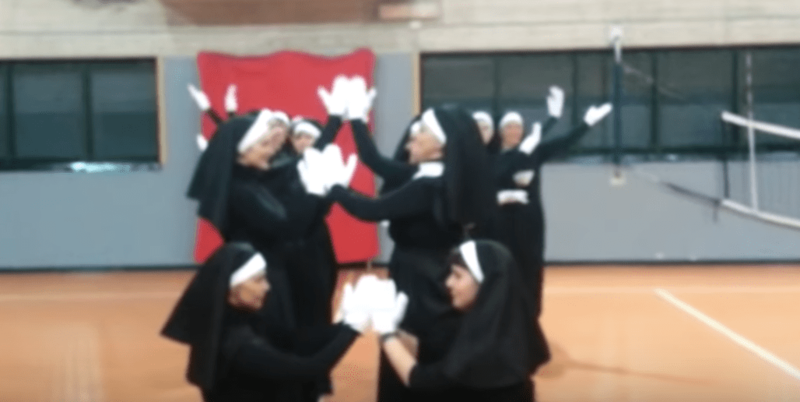 The finale of the movie is when the convent performs “I Will Follow Him” in front of a packed house in front of the Pope. If you haven’t guessed yet, it was that last performance that this Zumba class decided to imitate. 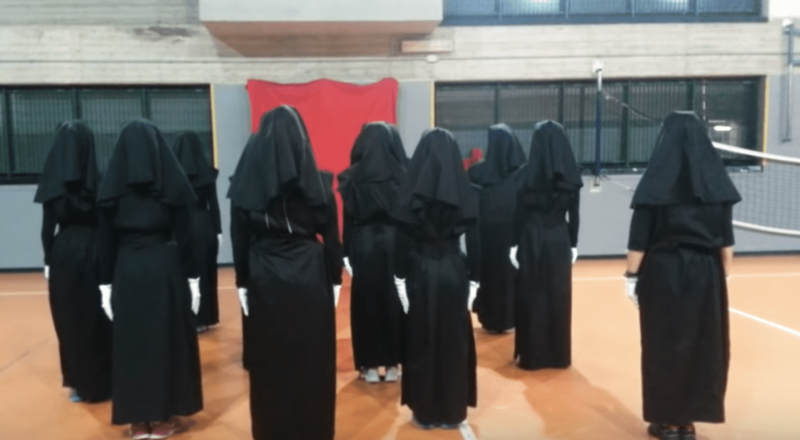 As the clip begins, the whole class is dressed in the traditional habits that Catholic nuns wear. Just like in the movie, everything begins quite slowly. All the dancers have their backs turned to the camera before gradually turning around. They all do some slow, sweeping movements as they get warmed up, dancing along to the sentiment of the song. As they turn all the way around, they do a few more sweeping motions and a turn before settling in. About halfway through the song, the real performance starts. As the music picks up speed and intensity, all the dancers burst into action. It starts with some quick footwork and some steps from side to side. After that, they start back into the same choreography as before, this time at double speed and with more dancing. Towards the end, they all start clapping and jumping before lining up for a grand finale. Together, all the women make a tunnel, some kneeling and some standing. They strike a pose and the performance is over. Needless to say, the dance has gotten worldwide attention. So far, the clip of the class has garnered more than a million views on YouTube! Just like anything in life, things can easily become routine if we’re not creative. When we go about our daily lives without trying to do anything new or exciting, we can get bored or grow tired of different aspects of our lives. As these dancers showed, going out of your own way to make the everyday things more exciting is not only inspiring to ourselves—it can even inspire the whole world! If you don’t have the dedication to go through all the choreography that these women did, at least you can use it as inspiration. 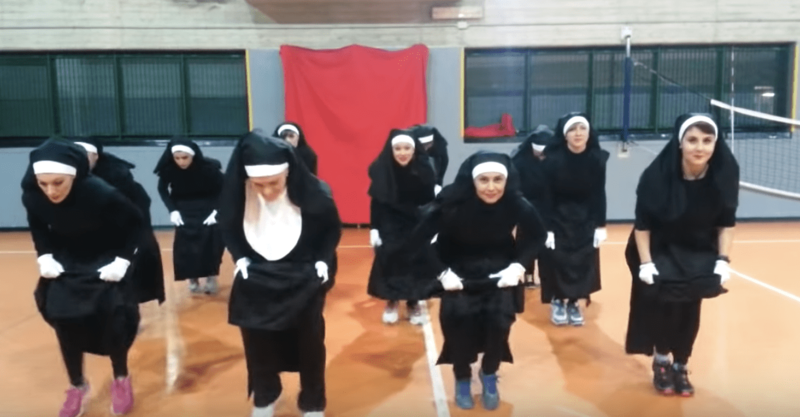 Still, that’s not the only time that a group of dancers has gotten creative in a Zumba class. Seeing as we’re in the Christmas season, it’s only right that we include this silly video as well. Much like the other video, all the dancers start off with their backs to the camera, dressed in traditional holiday garb. As the music starts, they spin into action. Throughout the clip, they do all kinds of moves from moving their hips, swinging their arms from side to side and even doing a few kicks! When it’s all over, everyone gets in formation for one last pose. If you weren’t in the Christmas spirit before, this video is sure to help with that! Needless to say, there are plenty of ways to add a little bit of creativity to the more boring parts of life. As both of these videos show, working out doesn’t have to be dry or boring. In fact, it can actually be a lot of fun! If you’ve never tried Zumba before, we can’t think of a better advertisement than these two videos. In any case, we’re pretty sure that everyone involved still burned plenty of calories.